Instead of taking part in their schools’ football games, dances, and other fun weekend activities, 360 Bay Area high school students (representing 70 countries) buckled down this past Friday, Nov. 3, 2017 and Saturday to discuss and provide workable solutions to many of our world’s biggest challenges, at the 27th annual Contra Costa County Model United Nations (UN) Conference, held at Diablo Valley College. Students served as delegates representing different countries. 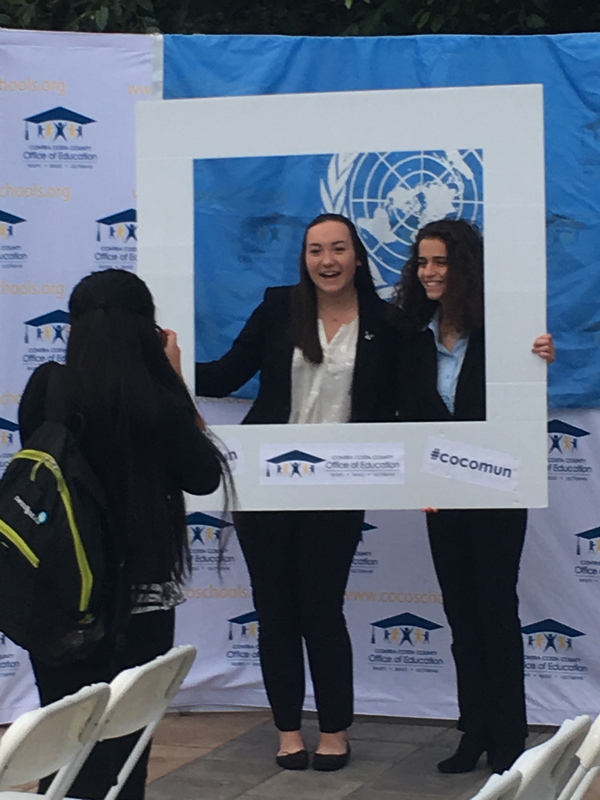 Bay Area high school teams participating in this year’s Contra Costa County Model UN were: Acalanes High (Lafayette), Athenian High (Danville), Berean Christian (Walnut Creek), California High (San Ramon), Campolindo High (Moraga), Carondelet High (Concord), De La Salle High (Concord), Deer Valley High (Antioch), Dougherty Valley High (San Ramon), Foothill High (Pleasanton), Liberty High (Brentwood), Lycée de Francais San Francisco (San Francisco), Miramonte High (Orinda), and Northgate High (Walnut Creek). 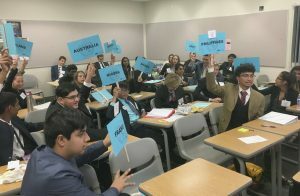 During the conference, delegates debated international issues in 10 committees, including Disarmament and International Security Committee (DISEC), Security Council (UNSC), United Nations Women (UN Women), World Health Organization (WHO), and United Nations Children’s Fund (UNICEF). Topics discussed will include Biological and Chemical Weapons, The Question of North Korea, Access to Clean Water and Sanitation, Children in Armed Conflict, and many more. For a complete list of committees and detailed topics, please visit this Web page. This year, California High earned the Outstanding Large Delegation Crystal Gavel Award, with Foothill High following with Exceptional Large Delegation Plaque. Miramonte High received the Outstanding Small Delegation Crystal Gavel Award, and Campolindo High brought home the Exceptional Small Delegation Plaque. 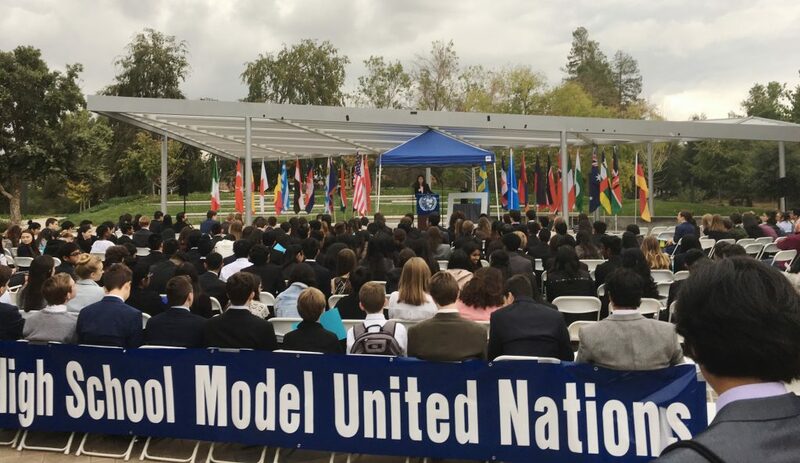 Numerous individual awards were earned, and will be listed on the Model UN Web page in the very near future. 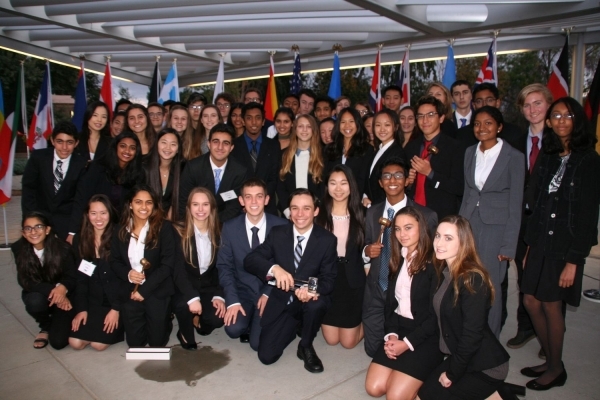 Cal High’s Model UN team was awarded the Outstanding Large Delegation Crystal Gavel Award. The student delegates had fund taking photos in front of the flag of the U.N.
Kevin Chan reported that the 35 U.C. Davis Model UN Club volunteers who presided over the Committee Meetings were extremely impressed with their younger brothers and sisters who share a tremendous interest in international affairs. Model UN differs from other CCCOE academic-event programs, such as Mock Trial, in that it is not so much a competition as it is an event. Participants are commended for outstanding committee work and certificates are awarded to committee rapporteurs. Individual delegate winners are recognized for their debate skills, leadership skills, knowledge of the issues, and presentation of key resolutions. The event closes with a ceremony that recognizes the outstanding delegates.